This butter saving cap that you can put over a bar of butter to keep it fresh is certainly a novel idea and one that could be very useful. 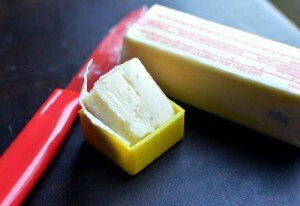 Basically it goes over the end of a stick of butter to keep it fresh where butter is typically exposed. 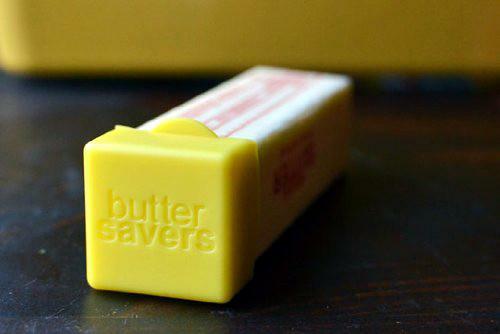 Keeps butter fresh by sealing off the end of a butter stick. Fits onto butter sticks typical along the East Coast of America. Basically 1.25 inches thick. Safe to wash in the dishwasher. Also measures a tablespoon of butter. This item is a fairly simple item that pretty much does what you would expect it to do. The cap itself is quite durable and is unlikely to break. It fits onto the vast majority of butter sticks as there seems to be something of a typical size for them. It makes a good item for chefs and such that see a lot of butter use and have their stick lying about but wish to keep it fresh or at least from getting onto other things nearby. One of the periphery benefits of this item is that it also keeps the butter from getting on things. For example sometimes you need to use butter repeatedly from the stick itself but it has an annoying habit of getting on your hand or objects that slide up next to it. This is a good solution to that and is more convenient. There are however two potential negatives with the item. The first negative is that it may not fit on all sticks of butter. Typically it does but the odd stick of butter is simply too large for it or even too small. The second negative with this item is that it is a bit gimmicky. By the time you have found it and attached it you almost would have been better off just wrapping it with cling wrap. Short version is that its a nice thing for people that use butter a lot but the rest of us probably can just use cling wrap.